﻿ Hero Renewables | If you’re considering installing a Ground Source Heat Pump, you must read this. 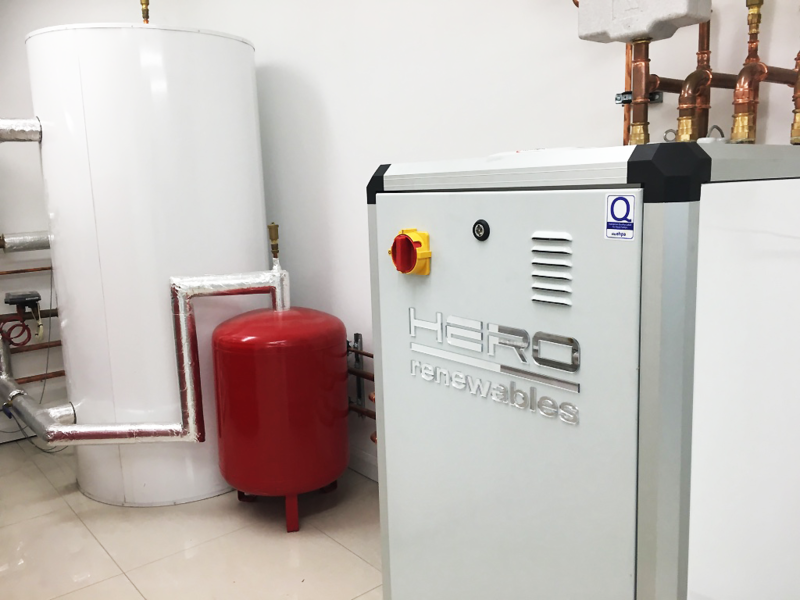 Hero Renewables | If you’re considering installing a Ground Source Heat Pump, you must read this. Home > Renewable Advice > If you’re considering installing a Ground Source Heat Pump, you must read this. 24 Feb If you’re considering installing a Ground Source Heat Pump, you must read this. If you are still skeptical about the benefits of Ground Source Heat Pumps please read on. A customer of ours Mr Perkins decided to recount his experience with his new Ground Source Heat Pump installation. We were delighted to help Mr Perkins achieve in what was, in the end, another successful Ground Source Heat Pump installation by Hero Renewables. About 8 years ago I came across an article on ramacorporation.com about renewable energy and was very sceptical of the description of Air Source and Ground Source heating systems. Further research gave a better understanding of the systems the cost and environmental benefits. Eventually I persuaded myself (and the management!) that we should go ahead with having a system installed in our house. We are off the gas grid and until the GSHP installation, had a solid fuel Aga, a LPG boiler and 2 log burners. The boiler and Aga were 30 years old as was the copper hot water cylinder so were “in need”. The simple choice was to replace the boiler for about £4k or go for renewable for about£30K simple choice? My initial simplistic question was: if we do away with the Aga, which costs £1200 per year for coal, would the £1200 cover most of the running cost of GSHP. On top of the coal cost the LPG (boiler rarely used but even so) was about £1000. (Electric on top of this) The Aga kept the kitchen warm and heated the domestic hot water and with the log burner the adjacent dining room was also warm. Since our heater broke in the main hall, the rest of the house was cool or cold. We tended to hibernate in this area during the winter dashing back when excursions to other parts of the house were visited! Our electric bill was £1600 last year (first year of GSHP) and with a change of supplier looks to be £1200 for next year, based on similar usage. This is all electrics and heating for a good size 4 bed house. I must admit my first concern was my wallet not the environment but both are benefitting! During our research we also built an understandable scepticism regarding the then newly detailed, Renewable Heat Incentive Scheme. The thought that the government would pay us some £30K over 7 years we thought too good to be true: when did that last happen? That the final payment profile depended on an independent assessment of our house heating needs also made us wary of companies who quoted for vastly differing sized systems; even after visiting the property to prepare “detailed surveys” We thought that the most costly system would be installed on the “if its big enough its bound to be adequate” principle and that the independent survey would give us a shortfall in payments. There was a lack of knowledge and acceptance of renewable systems in our area. Companies I contacted and the few who replied did not give me any reassurance that they fully understood the technology and its working principles. The more companies I contacted the wider the variance of the system we “needed” and the more sceptical I became! We decided, due to property layout and other factors that ground source with bore holes was the best choice. We nearly settled on a system; heating company would do all work in the house and the borehole company would drill the holes. At the last minute I asked who would do the trench work and manifold pit and both said it was the other’s job. So good boreholes, good system in house but no connections between the two! At this stage I nearly gave up. I eventually contracted Hero Renewables from 150 miles away to do the work who were able to give me the reassurances I needed and to be fair to them answered all my questions and showed in depth understanding of all aspects of renewables. If you are looking into Ground Source Heat Pumps, feel free to contact our team for free consultancy on 0808 222 0 111.